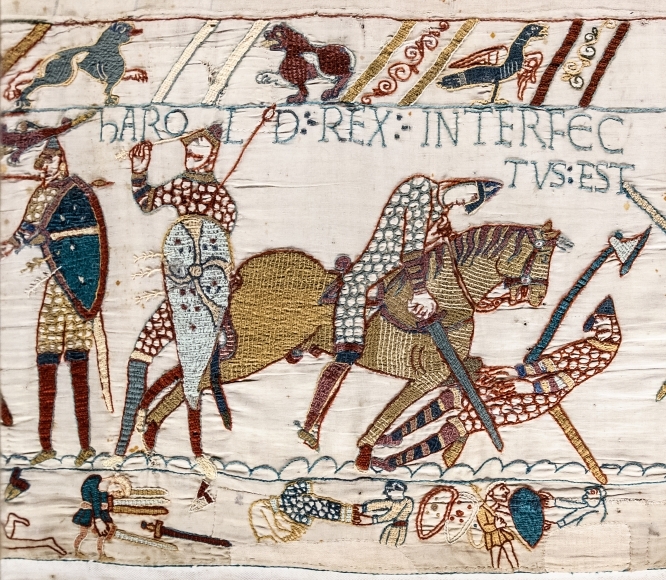 Essentially, the Battle of Hastings was all Edward the Confessor’s fault: in the years before his death he had not been clear about the succession and in 1066 the two leading pretenders to the English throne ended up thrashing it out in the countryside of East Sussex. As we all know, Harold lost and William won, which left the victorious new king from the other side of the Channel with a PR problem. How to convince his new subjects (particularly any resentful English lords) that he was their legitimate ruler? William the Conquerer’s half-brother Bishop Odo came up with a solution in the 1070s. The Normans would state their side of the story in a massive tapestry, around 70metres long and 50cms high; fifty or so embroidered cartoons reinforcing William’s authority, glory and legitimacy. And it would be made in England.